“The Boonshoft School of Medicine provides a curriculum that is forward-thinking, faculty who practice and research contemporary medicine, and a learning environment that nourishes the professional and personal growth of every student." 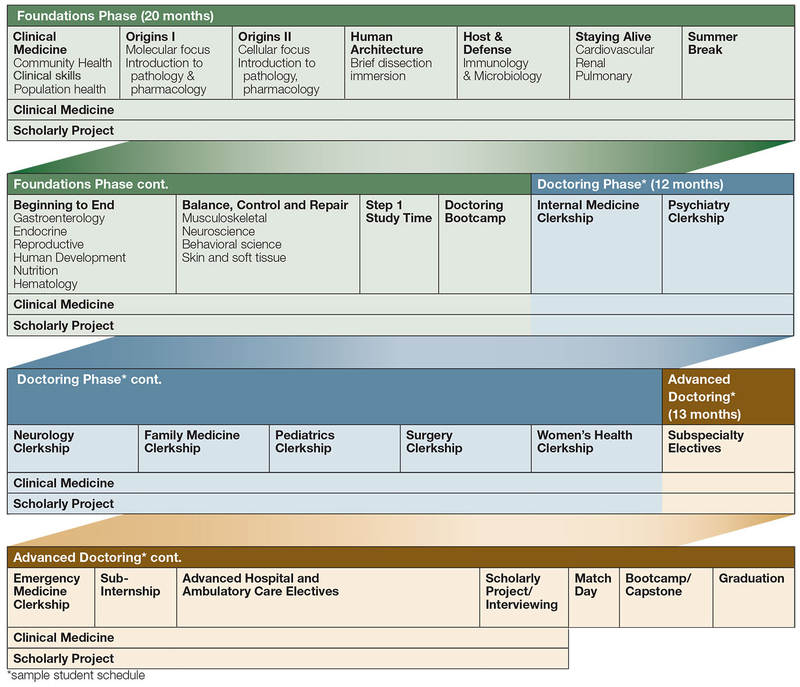 There are three phases: Foundations (70 weeks), Doctoring (52 weeks), and Advanced Doctoring (52 weeks). Unlike traditional curricula, this curriculum integrates the learning of the “normal” and the “abnormal” within the context of clinical application. For instance, Origins concentrates on the molecular and cellular underpinnings of homeostasis, and one learns about diabetes while learning about carbohydrate and lipid metabolism. Similarly, in Advanced Doctoring, one will investigate the latest treatment approaches for this disease from an understanding of their molecular and genetic mechanisms. WrightCurriculum takes a developmental approach using “Milestones” that build one upon the other from the first weeks until graduation. Students know where they are in their knowledge, clinical skills, and professionalism as they progress. Since the class size is relatively small at 120 students and the teaching and learning methods are “flipped” classroom style, there is a great deal of small group collaborative learning, as well as coaching and support from faculty and staff. Below is a word cloud developed from the inaugural class reflecting on their year's experience with their "teams," which started their first week of medical school. A powerful image representing one of the greatest strengths of the WrightCurriculum. During the Foundations Phase classroom time is devoted to asking and solving questions and problems, using what one has learned from outside studying, and then applying it in the classroom. We have no lectures! 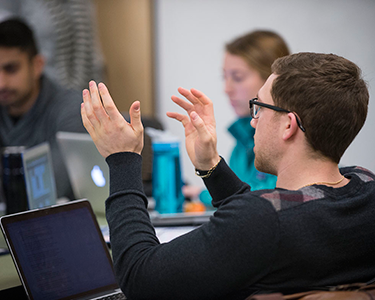 Students master assigned content outside the classroom so that classroom time with faculty is devoted to applying content to answer high-order-thinking questions about biomedical concepts and clinicial application. Teaching by the faculty becomes focused on probing for deeper understanding and clarifying misconceptions. Classroom time is highly interactive — very unlike traditional lectures. Doctoring starts in the spring of the second year. This phase provides extensive supervised clinical experience in a range of clinical facilities and practices in the region. Core specialty clerkships provide both the requisite clinical skills and reinforce the integration of biomedical and clinical science, and habits of life-long learning. Advanced Doctoring, largely flexible and dependent upon student interests, completes the final year of medical school with robust preparation for residency. Throughout the three phases of the curriculum, including Clinical Medicine, Scholarship in Medicine and more than 50 student interest groups and organizations, extra-curricular courses such as Healer’s Art, and service learning opportunities build a set of skills and attitudes that are the hallmark of the physician as the professional. The capacity to listen generously to patients and their families, conduct a comprehensive or focused physical examination, work collaboratively with other health care professionals in team settings, keep current with the medical literature, and make clinical decisions that are ethical and evidence-based are just a sample of the characteristics of humanistic physicians. WrightCurriculum is built for physician education in the 21st century. Besides preparing one for success on the many national licensing examinations, it is delivered in the context of a very supportive and collaborative learning environment, and fosters the personal and professional growth of its students.